1. A finite world is a problem because we and all of the other creatures living in this world share the same piece of “real estate.” If humans use increasingly more resources, other species necessarily use less. Even “renewable” resources are shared with other species. If humans use more, other species must use less. Solar panels covering the desert floor interfere with normal wildlife; the use of plants for biofuels means less area is available for planting food and for vegetation preferred by desirable insects, such as bees. 2. A finite world is governed by cycles. We like to project in straight lines or as constant percentage increases, but the real world doesn’t follow such patterns. Each day has 24 hours. Water moves in waves. Humans are born, mature, and die. A resource is extracted from an area, and the area suddenly becomes much poorer once the income from those exports is removed. Once a country becomes poorer, fighting is likely to break out. A recent example of this is Egypt’s loss of oil exports, about the time of the Arab Spring uprisings in 2011 (Figure 1). The fighting has not yet stopped. Figure 1. 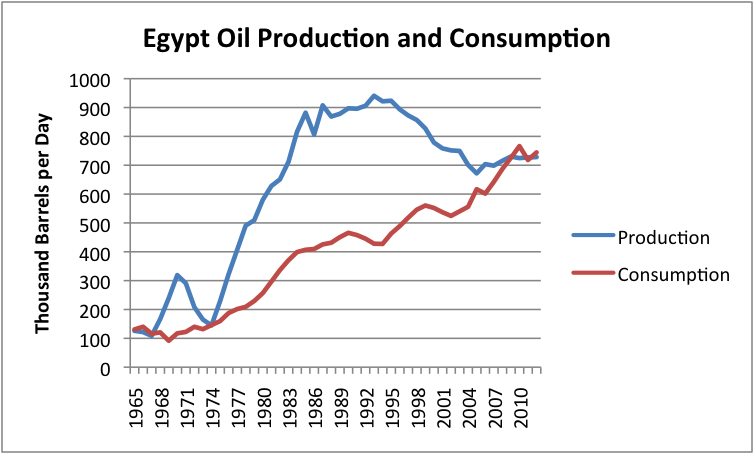 Egypt’s oil production and consumption, based on BP’s 2013 Statistical Review of World Energy data. 3. A finite world means that we eventually run short of easy-to-extract resources of many types, including fossil fuels, uranium, and metals. This doesn’t mean that we will “run out” of these resources. Instead, it means that the extraction process will become more expensive for these fuels and metals, unless technology somehow acts to hold costs down. If extraction costs rise, anything made using these fuels and metals becomes more expensive, assuming businesses selling these products are able to recover their costs. (If they don’t, they go out of business, quickly!) Figure 2 shows that a recent turning point toward higher costs came in 2002, for both energy products and base metals. Figure 2. 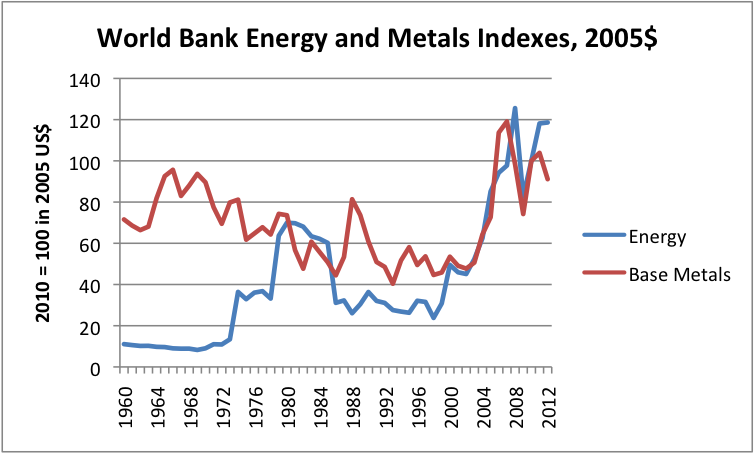 World Bank Energy (oil, natural gas, and coal) and Base Metals price indices, using 2005 US dollars, indexed to 2010 = 100. Base metals exclude iron. Data source: World Bank. 4. A finite world means that globalization will prove to be a major problem, because it added proportionately far more humans to world demand than it added undeveloped resources to world supply. China was added to the World Trade Organization in December 2001. Its use of fuels of all types skyrocketed quickly soon afterward (Figure 3, below). As noted in Item 3 above, the turning point for prices of fuels and metals was in 2002. In my view, this was not a coincidence–it was connected with rising demand from China, as well as the fact that we had extracted a considerable share of the cheap to extract fuels earlier. Figure 3. 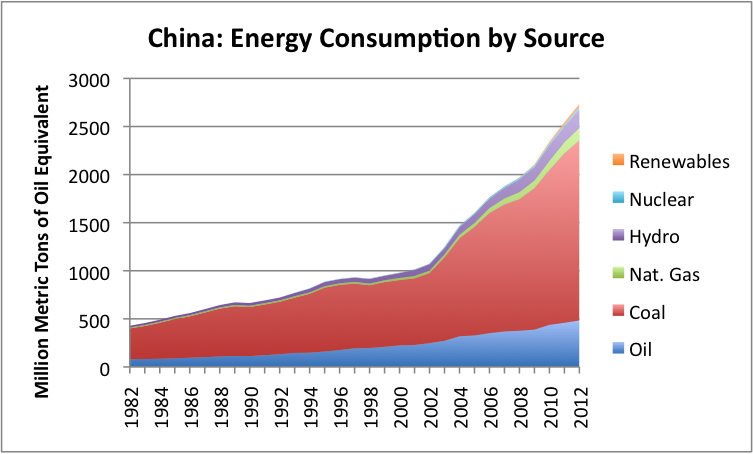 Energy consumption by source for China based on BP 2013 Statistical Review of World Energy. 5. In a finite world, wages don’t rise as much as fuel and metal extraction costs rise, because the extra extraction costs add no real benefit to society–they simply remove resources that could have been put to work elsewhere in the economy. We are, in effect, becoming less and less efficient at producing energy products and metals. This happens because we are producing fuels that are located in harder to reach places and that have more pollutants mixed in. Metal ores have similar problems–they are deeper and of lower concentration. All of the extra human effort and extra resource expenditure does not produce more end product. Instead, we are left with less human effort and less resources to invest in the rest of the economy. As a result, total production of goods and services for the economy tends to stagnate. In such an economy, workers find that their inflation-adjusted wages tend to lag. (This happens because the total economy produces less, so each worker’s share of what is produced is less.) Companies producing energy and metal products are also likely to find it harder to make a profit, because with lagging wages, consumers cannot afford to buy very much product at the higher prices. In fact, there is likely to be the danger of an abrupt drop in production, because prices remain too low to justify the high cost of additional investment. a. If workers can afford less, they cut back in discretionary spending. This tends to slow or eventually stop economic growth. Lack of economic growth eventually affects stock market prices, since stock prices assume that sale of their products will continue to grow indefinitely. b. If workers can afford less, one item that is increasingly out of reach is a more expensive home. As result, housing prices tend to stagnate or fall with stagnating wages and rising fuel and metals prices. The government can somewhat fix the problem through low interest rates and more commercial sales–that is why the problem is mostly gone now. c. If workers find their wages lagging, and some are laid off, they increasingly fall back on government services. This leaves governments with a need to pay out more in benefits, without being able to collect sufficient taxes. Thus, governments ultimately end up with financial problems, if extraction costs for fuels and metals rise faster than can be offset by innovation, as they have been since 2002. Last year, 80 big energy companies in North America spent a combined $50.6 billion more than they brought in from their operations, according to data from S&P Capital IQ. That deficit was twice as high as in 2011, and four times as high as in 2010. 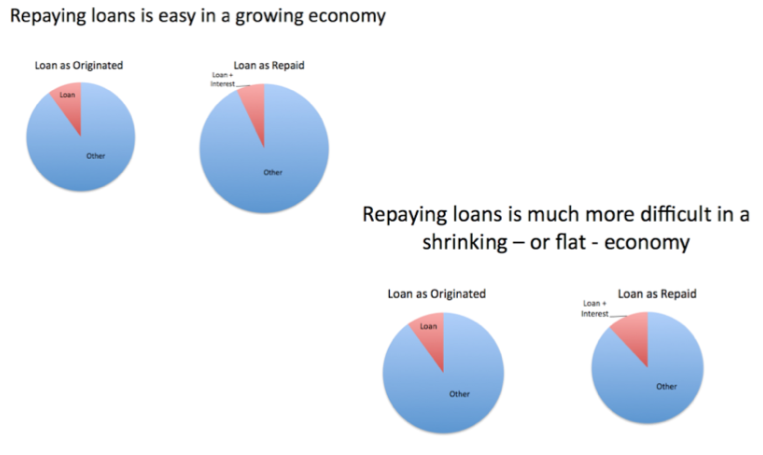 At the same time that the need for debt is increasing, the ability to pay it back is falling. Discretionary income of workers is lagging, because of today’s high prices of fuels and metals. Governments find it difficult to raise taxes. Fuel and metal companies find it hard to raise prices enough to finance operations out of cash flow. Ultimately, (which may not be too in the future) this situation has to come to an unhappy end. Governments can cover up this problem for a while, with super low interest rates. But if interest rates ever rise again, the increase in interest rates is likely to lead to huge debt defaults, and major financial failures internationally. This happens because higher interest rates lead to a need for higher taxes, and because higher interest rates mean purchases such as homes, cars, and new factories become less affordable. Rising interest rates also mean that the selling price of existing bonds falls, potentially creating financial problems for banks and insurance companies. 8. The fact that the world is finite means that economic growth will need to slow and eventually stop. 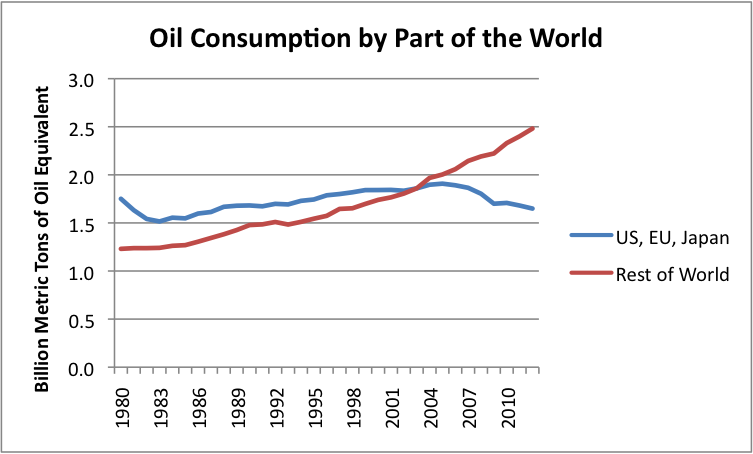 We are already seeing slower economic growth in the parts of the world that have seen a drop in oil consumption (European Union, the United States, and Japan), even as the rest of the world has seen rising oil consumption. Countries that have had particularly steep drops in oil consumption, such as Greece (Figure 6 below), have had particularly steep drops in their economic growth, while countries with rapid increases in oil and other energy consumption, such as China shown in Figure 2 above, have shown rapid economic growth. Figure 6. 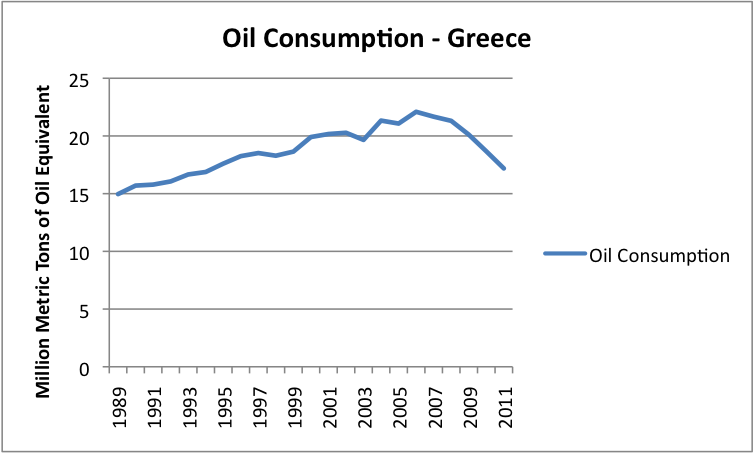 Oil consumption of Greece, Based on EIA data. The reason why we are already reaching difficulties with oil consumption is because for oil, we are reaching limits of a finite world. We have already pulled out most of the easy to extract oil, and what is left is more expensive and slow to extract. World oil production is not rising very fast in total, and the price needs to be high to cover the high cost of extraction. Someone has to be left out. The countries that use a large proportion of oil in their energy mix (like Greece, with its tourist trade) find that the products they produce are too expensive in a world marketplace. Countries that use mostly coal (which is cheaper), such as China, have a huge cost advantage in a cost-competitive world. 9. The fact that the world is finite has been omitted from virtually every model predicting the future. This means that economic models are virtually all wrong. The models generally predict that economic growth will continue indefinitely, but this is not really possible in a finite world. The models don’t even consider the fact that economic growth will scale back in mature economies. Even climate change models include far too much future fossil fuel use, in both their standard runs and in their “peak oil” scenarios. This is convenient for regulators. Oil limits are scary because they indicate a possible near-term problem. If a climate change model indicates a need to cut back on future fossil fuel use, these models give the regulator a more distant problem to talk about instead. 10. Even the most basic economic relationships tend to be mis-estimated in a finite world. It is common for economists to look at relationships that worked in the past, and assume that similar relationships will work now. For example, researchers like to look at how much debt an economy can afford relative to GDP, or how much debt a business can afford. The problem is that the amount of debt an economy or a business can afford shrinks dramatically, as the economic growth rates shrinks, unless the interest rate is extremely low. As another example, economists believe that higher prices will lead to substitutes or a reduction in demand. Unfortunately, they have never stopped to consider that the reduction in demand for an energy product might have a serious adverse impact on the economy–for example, it could mean many fewer jobs are available. Fewer jobs mean less demand (or affordability), but is that what is really desired? Economists also seem to believe that prices for oil products will keep rising, until they eventually reach the price level of substitutes. If people are poorer, this is not necessarily the case, as discussed above. 11. Besides energy products and metals, there are many other limits that are a problem in a finite world. There is already an inadequate supply of fresh water in many parts of the world. This problem can be solved with desalination, but doing so is expensive and takes resources away from other uses. Arable land in a finite world is subject to limits. Soil is subject to erosion and degrades in quality if it is mistreated. Food is dependent on oil, water, arable land, and soil quality, so it quickly reaches limits if any of these inputs are disturbed. Pollinating insects, such as bees, are also important. Probably the biggest problem in a finite world is the problem of too high population. Before fossil fuel use was added, the world could feed only 1 billion people. It is not clear that even that many could be fed today, without fossil fuels. The world’s population now exceeds 7 billion. The primary way of dealing with limits seems to be “solutions” dictated by concern over climate change. These solutions are of questionable benefit when it comes to the real limits of a finite world, but they do make it look like politicians are doing something useful. They also provide a continuing revenue stream to academic institutions and “green” businesses. The public has been placated by all kinds of misleading stories about how oil from shale will be the solution. Quantitative Easing (used by governments to lower interest rates) has temporarily allowed stock markets to soar, and allowed interest rates to stay quite low. So superficially, everything looks great. The question is how long all of this will last. Will interest rates rise, and undo the happy situation? Or will a different financial problem (for example, a debt problem in Europe or Japan) bring the house of cards down? Or will the ultimate problem be a decline in oil supply, perhaps caused by oil and gas companies reaching debt limits? 2014 will be an interesting year. Let’s all keep our fingers crossed as to how things will work out. It is surreal how close we can be to limits, without major media catching on to what the problem really is. This entry was posted in Financial Implications and tagged climate models, debt limits, economic growth, economic models, finite world. Bookmark the permalink.